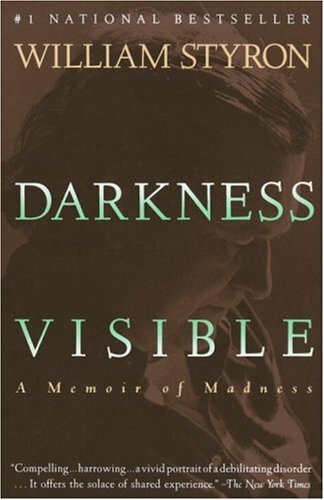 BOOK REVIEW: Darkness Visible: A Memoir of Madness by William Styron (1990). The full-text is available on the Internet Archive. “Darkness Visible: A Memoir of Madness” by William Styron (1990). Suffering from depression and dwelling upon old memories of Paris, the author William Styron recalls a startling conclusion he had: “I would never see Paris again.” Never again would he see the land Camus who, he notes, once wrote that the must fundamental question of philosophy is whether life is worth living. Soon he would need to answer Camus’ question. How he did so is detailed in his short book Darkness Visible: A Memoir of Madness (1990), an extension of a 1989 essay he wrote for Vanity Fair. Perhaps best-known for his novel Sophie’s Choice, Darkness Visible is more than an account of his descent and eventual recovery: it’s a beautifully-written meditation on how we engage and respond to mental illness as not only the victim but as a community. While disappointed in the stigma associated with it, Styron understands that “the horror of depression is so overwhelming as to be quite beyond expression, hence the frustrated sense of inadequacy found in the work of even the greatest artists” (83). He can hold the reader’s hand but there are some places he cannot go – not by choice but because language fails us. As things grow worse he becomes tired of the platitudes of psychiatrists and “[t]he failure of these pills to act positively and quickly” (55). Everything he is told begins to feel like empty promises and so he writes, “There is a region in the experience of pain where the certainty of alleviation permits superhuman endurance” (61). Lacking it, he feels he has no other options. Rushing to wake up his wife to tell her of his revelation, the next day he is admitted to the hospital. Appallingly, in the early stages of his treatment, his psychiatrist had advised him against this “owing to the stigma I might suffer” (68). Rightfully upset, he discusses his rehabilitation and chastises a system that, nearly thirty years later, hasn’t changed – and Styron was writing before major antidepressants like Prozac made it onto the market. This may work for some, he acknowledges, but had it not been for one brief, lucid moment this memoir would have not been written. Styron was one of the lucky ones, which he makes poignant by naming those who weren’t: Albert Camus, Romain Gary, Abbie Hoffman, and a handful of others. This is to say nothing of the thousands who live and die without even a line on Wikipedia.